The Face Shop X Kakao Friends Limited Edition Collection is too cute to resist! 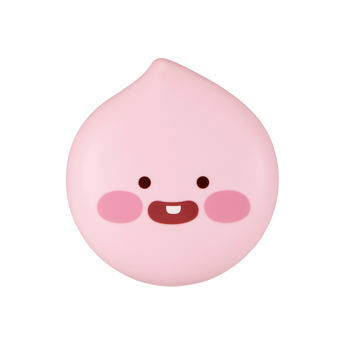 Fans of Kakao Friends will be delighted to know that The Face Shop teamed up with the Korean lifestyle brand to launch the "Sweet Apeach" collection with brand's best-selling products such as lip tints, eyeshadow palettes, sunscreen cushion, as well as the Dr. Belmeur skincare products, all packaged in playful Sweet Apeach packaging. The Face Shop Kakao Friends Edition Natural Sun Eco Baby Sun Cushion SPF28 PA++ is a gentle, cushion-type sun cream that can also be used on a baby's tender skin as it is formulated with ingredients free of seven harmful substances including eco-certified organic sunflower sprout extract and a mineral UV filter. The washable formula washes off with water and requires no cleanser, making it ideal for a baby's sensitive skin. It features a seven free formula, which means it does not contain parabens, tar colour, animal raw materials, mineral oil, talc, paraffins and polyacrylamides. About the Brand:Beauty treasure for millions around the globe, Face Shop is a South-Korean skincare line that provides fabulous goodies for your daily skin and beauty rituals. This sensational brand believes in creating skin care products that stem from a lovely concept of 'Science meets Beauty', getting you all benefits nature has to offer and to enhance your natural beauty! At Face Shop you will find the best product for each step of your beauty ritual: masks, skin care, makeup and body care. With over 20 collections of cosmetic products, you are sure to better your natural beauty. Explore the entire range of Face Sunscreen available on Nykaa. Shop more The Face Shop products here.You can browse through the complete world of The Face Shop Face Sunscreen .